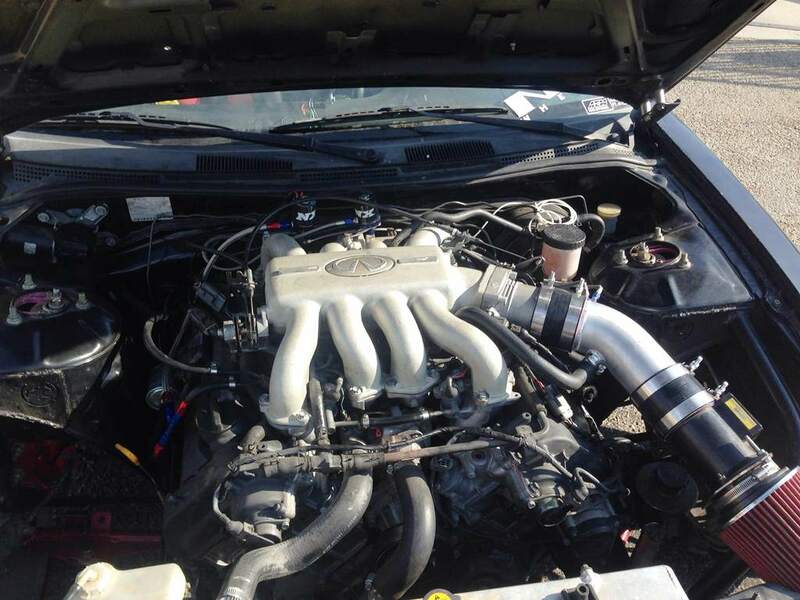 You won’t find the typical SR engine in this S14. Still powered using a Nissan engine, the sound alone will let you know its packing more under the hood. Reza had us install a Nistune board in the ECU so we could tune the car. We also cleaned up a few things throughout the car, installing colder spark plugs, replacing coil pack connectors, etc. We also finished up the install of a Nitrous Express nitrous system. We made a new intake pipe to properly hold the new NX Shark Nozzle. We went with a small 50HP shot to give Reza a nice blast of instant power and torque when needed. Our baseline pull is in blue, note the torque and power drop offs throughout the powerband. We finished up our 91 octane tune in green. Great gains everywhere. 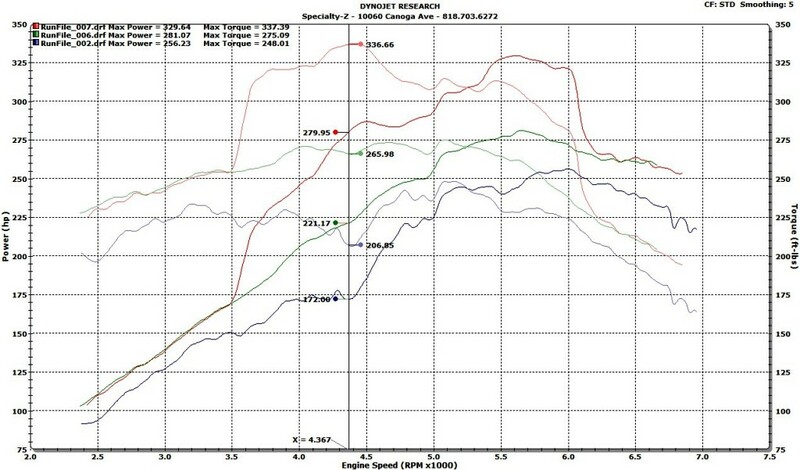 We gained as much as 60 lb\ft of torque and 50 whp in certain areas! We installed the Nitrous Express Maximizer 4 controller to make sure our nitrous shot (50HP), would only turn on when it should. This meant turning it on above 3500 RPMs and shutting it off completely by 6500 RPMs. Ensuring that we wouldn’t be too close to the rev limiter. 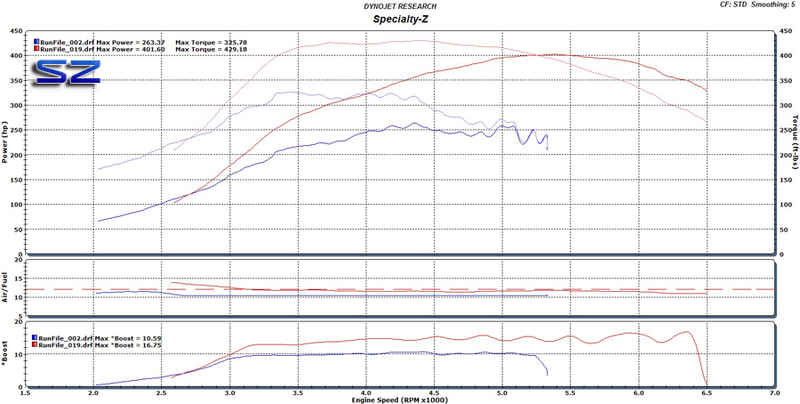 Nitrous and factory rev limiters do not work well together. The controller also allows us to set throttle activation. We made sure that it would come on above 75% throttle openings. Another great feature this controller allows us to do is progressively turn on and off the nitrous. We have it coming on 100% at 3500 RPMs but as we get to 6500 RPMs we taper the nitrous duty cycle. Nitrous run is red if it wasn’t obvious enough. A fantastic way to increase power. Nitrous should only be used in controlled environments where the user can ensure that pressures are correct and regular maintenance is performed. 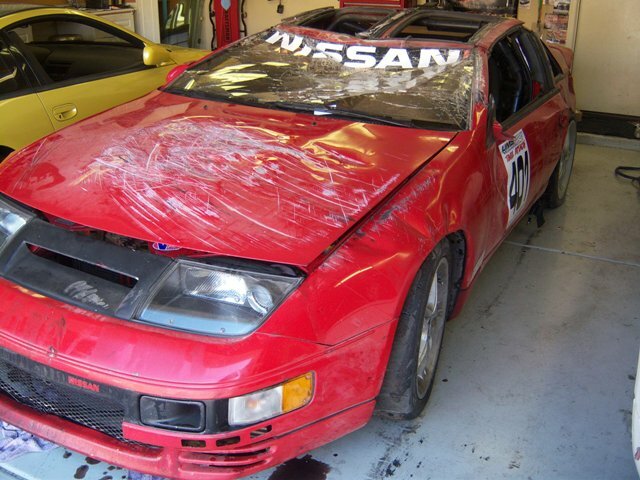 Over the past weekend John Garrison was racing his red Z32TT at the road course and ended up upside down. Thankfully John came out with no injuries. hey guys, wanted to let you know that I am ok, aside from some soreness. Last session of the night event, got off line. There was no run off area, just about 10 feet of sand then a tire wall. The Z hit the tire wall and caught, then just launched it. People say 3 1/2 flips, did not feel like it, crazy. Ended up upside down, the partial roll bar keep the whole top of collapsing on me. Won’t go back on track without a full rollbar. Engine, drive train, exhaust all seem to be ok (still have to dig into it), have a rolling chassis that I am going to transfer everything into. Its a miracle John walked away clean. Thank God! Safety first. A previous blog post about ZONAZ. 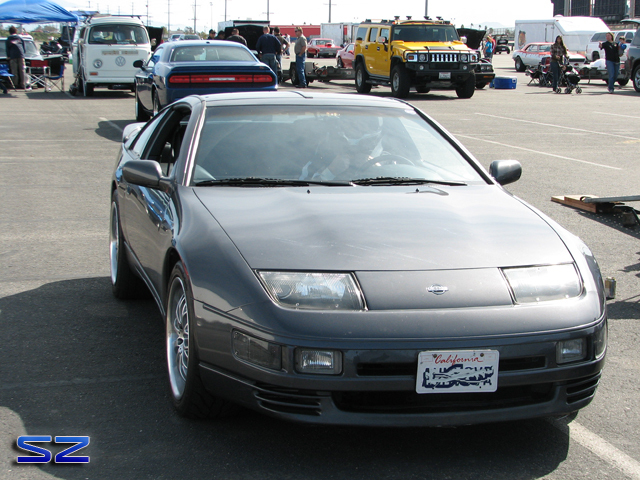 Cons’ 2nd Z and (track) beater is this NA Z32 that graces its presence on our blog. Its a slicktop that serves its purpose as a road race Z so that his pretty white TT can sleep peacefully knowing no rock chips or deadly oil starving corners await ready to pounce. On its first stop to SZ we fixed a major oil leak, rerouted\fixed his PCV system, added an Unorthodox Crank Pulley, HI OD Water Pump Pulley, fixed some suspension issues, and finally strapped it on the dyno to see what this little NA VG had in it. 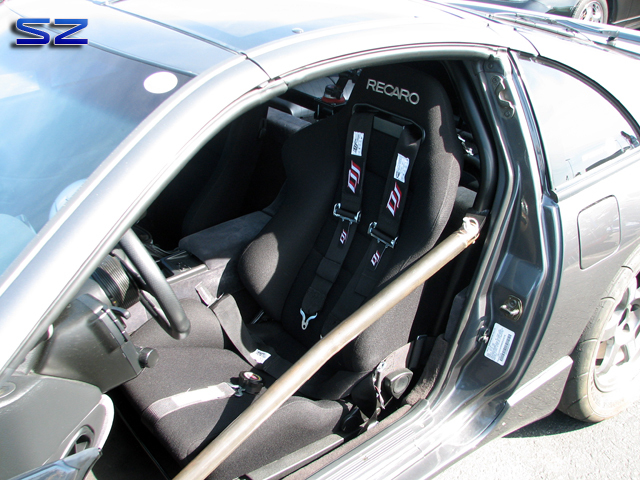 Engine mods are limited to a catback, UD pulley, and pop filter. Rotora Brakes, Powertrix Coilovers, strut tower braces (F&R) and a mix of other adjustable rods and arms round up the braking & suspension mods. We made one pull and found that it was running extremely lean (blue run). This confirmed my thinking on how far off the NA programs are off stock or tuned. Fuel changes over the years has really adversely affected mixtures. This is the 4th NA that’s come in this way. Making 2 pulls we were able to richen up the mixture (red run) to be safer and add some much needed power that the VG30DEs need. Any will help even if its +7 HP. Ignition timing was not adjusted since this was a quick and dirty pull just to see how much power it made. No intentions on tuning. So there maybe some more left in it, however Cons will wait until he pulls the trigger on a set of cams and headers. Stay tuned for more from this little NA. Job well done and thank you for allowing us to provide you with our services! 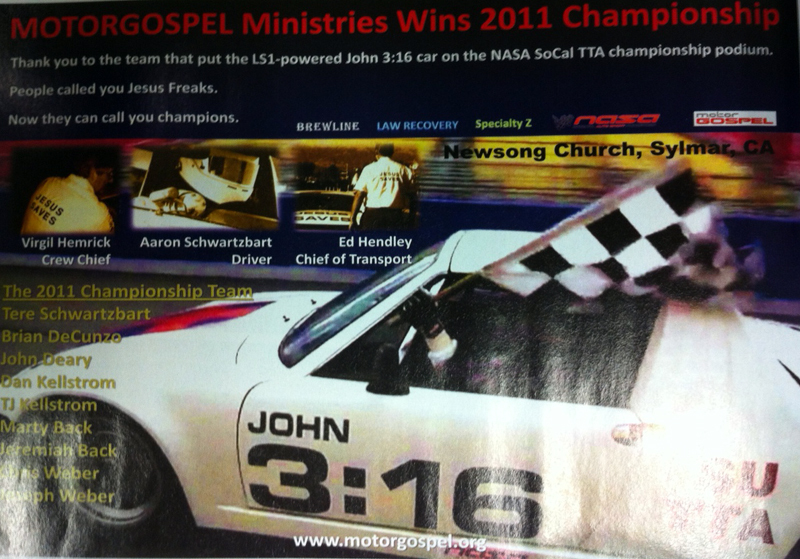 Check out this month’s Grassroots Motorsports Magazine! Nissan is offering the 370Z track ready for the serious racer\enthusiast. If you’ve ever wanted to extend your love of the iconic Nissan Z-car from the street to the track, now is a good time to take action. 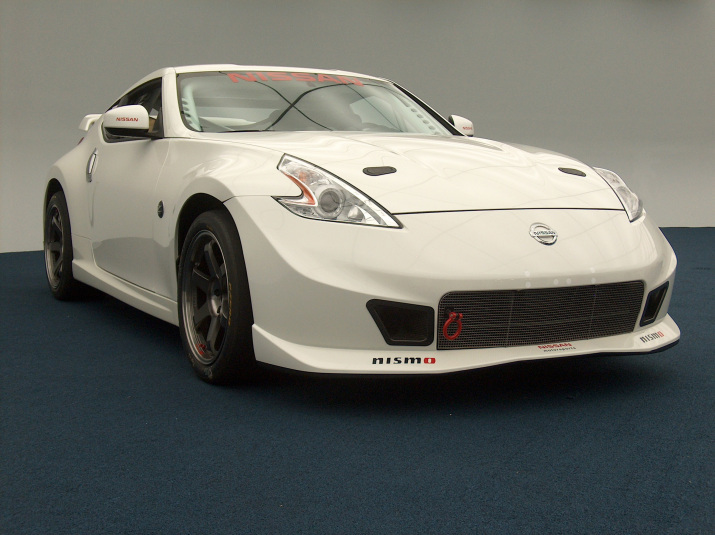 Nissan Motorsports is now offering Nissan 370Z race cars for customer orders. The track-ready Nissan 370Z NISMO RC is based on the street legal Z-car, but is significantly lighter and fitted with a FIA-compliant roll cage, fire extinguisher, racing seat and numerous NISMO performance upgrades. The Nissan 370Z NISMO RC has been designed to conform to International FIA GT4 and World Challenge GTS class specifications. 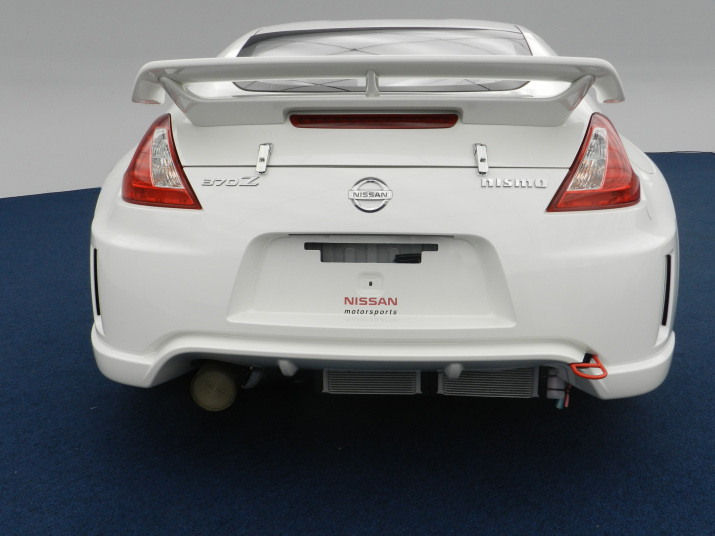 With some modifications, the Nissan 370Z NISMO RC can also compete in the Grand Am Continental Tire Challenge GS class. Weighing in at 2,954 lbs., the Nissan 370Z NISMO RC features NISMO race exhaust, NISMO tuned ECM, high capacity NISMO clutch, flywheel, engine oil, transmission and differential coolers and a Recaro racing seat with 6-point racing harness. 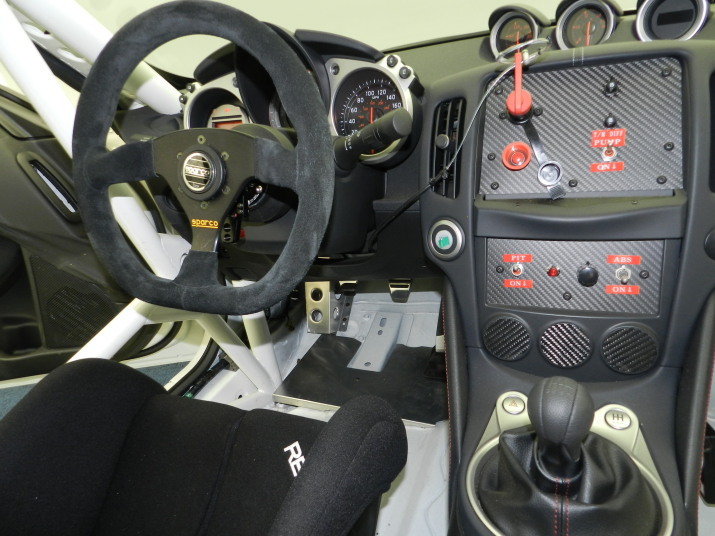 A Sparco racing steering wheel and a revamped and race-ready carbon fiber switch panel are also part of the RC package. 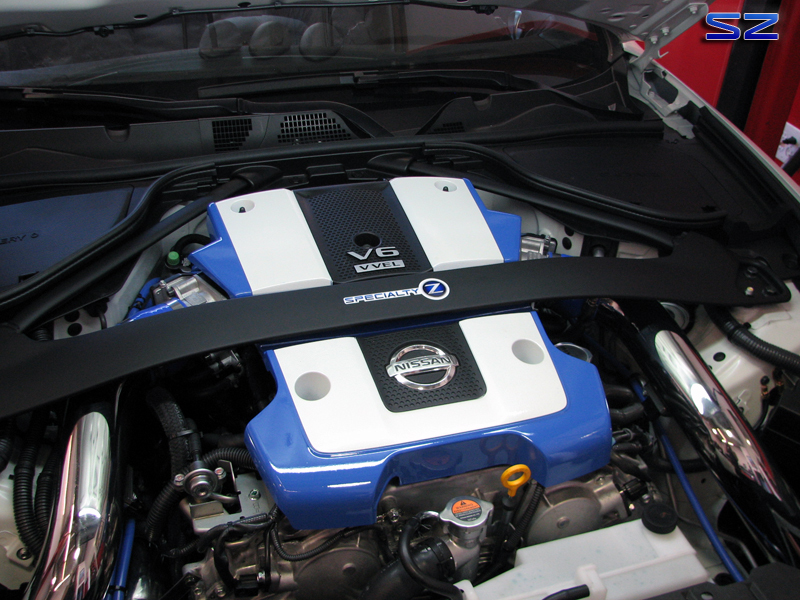 The 3.7 liter Nissan VQ37VHR powerplant is rated at 355 horsepower and 276 ft. lbs. of torque. Numerous hose and connector upgrades have been added to meet the rigorous demands of track use. 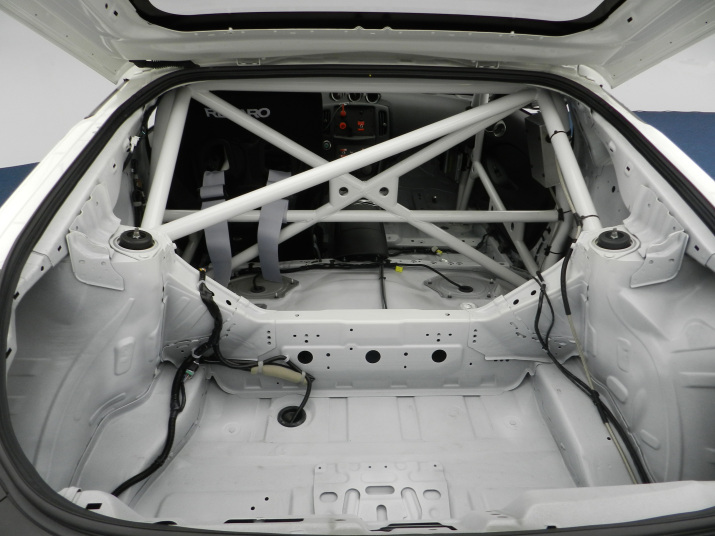 Nissan Motorsports provides an easy way to race its 370Z in a competitive professional racing series. Interested parties may contact Nissan Motorsports at 1 (888) 833-3225 for more information. Twin oil coolers sitting below and race muffler. Let’s start off our Memorial Day Weekend with our boy Dean chalking up another IDRC win this past April 23rd making it the 2nd time he’s taken 1st at an IDRC event. 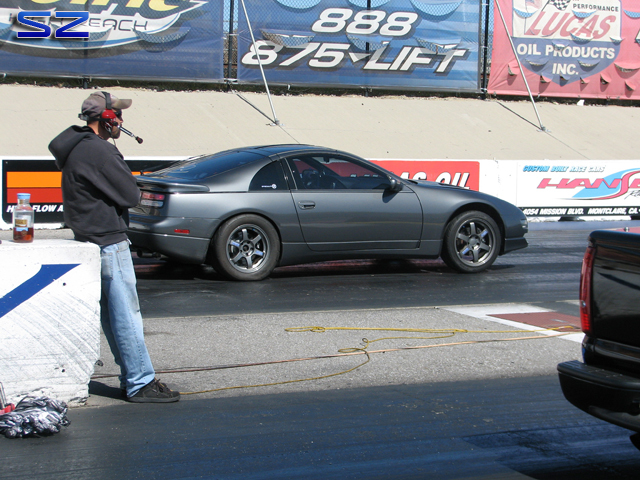 Dean qualified with a 10.2 @ 135MPH, running a 10.6 @ 137MPH in the finals. 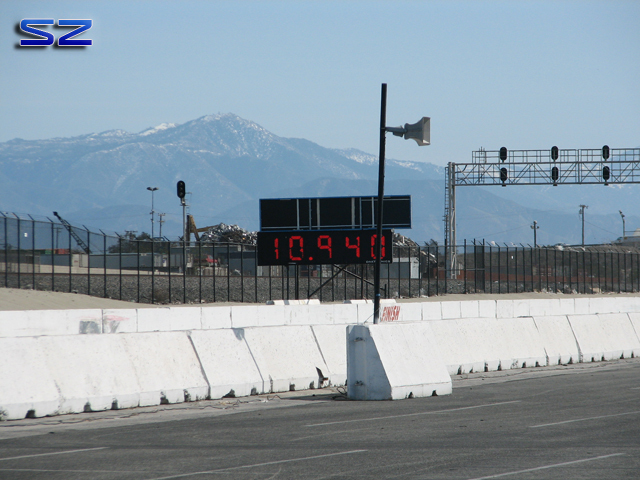 With his MPH going over 135 MPH Dean was officially “black-listed” from Auto Club Speedway until he adds more safety equipment which includes full cage and NHRA licensing. Dean has no interest in bringing the car up to safety status since it will make the car too safe racy and uncomfortable for the street. 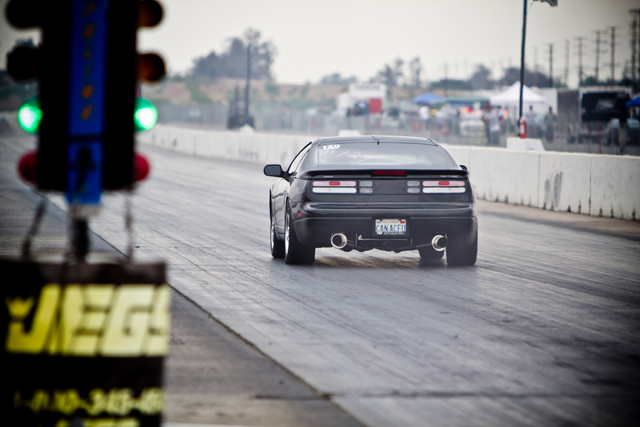 His 9 second pass will have to be done at another drag strip, did someone say Bakersfield run? For those who don’t know much on Dean’s Z, he runs our SZ EXP-90 Kit (3071s) & SZ Race Long Block. More info here. Dean’s fuzzy on the details on who he ran in the semi\quarter finals. 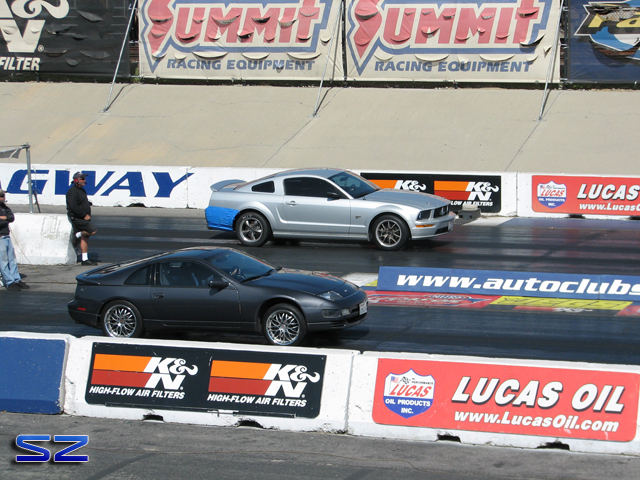 His final run was up against Jeff Church in his 700HP Supra. In the finals versus Jeff in his Supra. Wow! 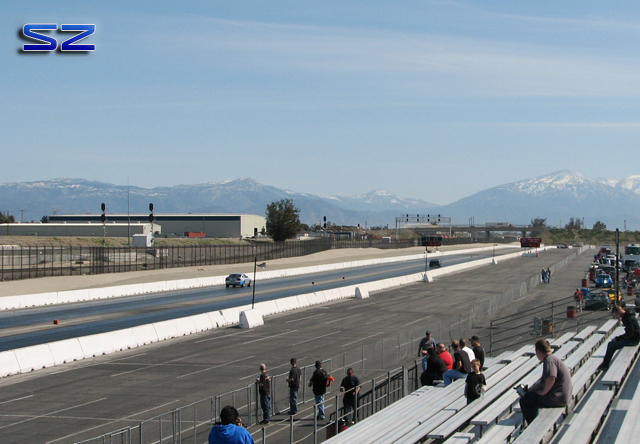 It’s been over 6 years since we’ve had a private track rental at our local drag strip. The huge benefits of participating in a private track day is you have nicer cars, nicer people (IQ level seems to be higher as well), better track prep or cars that don’t ruin track prep by breaking or running crappy street tires, and as many runs your heart desires (or your equipment!). For those in SoCal or anyone for that matter that wants to be a part of the next event, click here. As usual I had very little time to prep for the even. Luckily for me and the Z, Dean & Joel were able to get my harnesses’ SFI re-certified just in the knick of time. 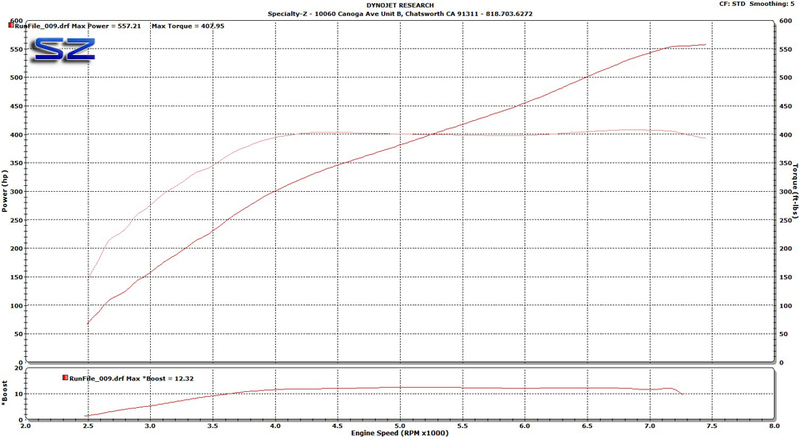 A late night tuning session was also in order for my Z on Q16. 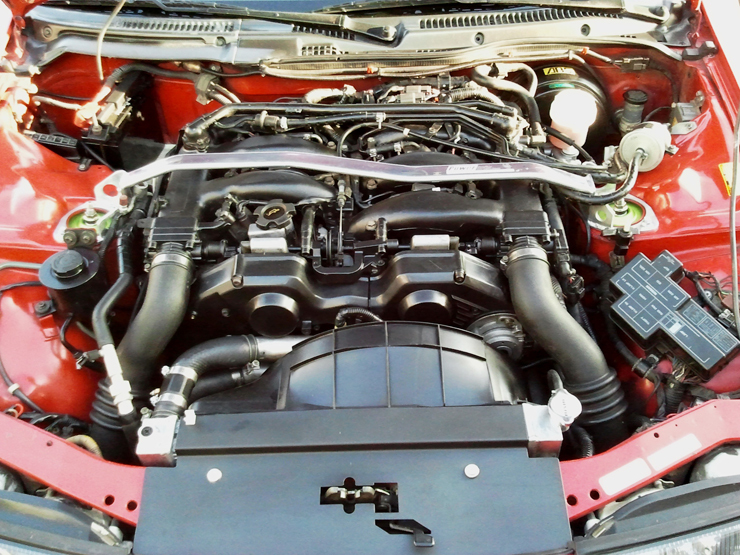 For those who have no idea what’s under the hood of my Z32, click here. The two major differences since that post were Ash Massives I\Cs & 2.5″ I\C Piping. The best the Z had done previously was an 11.3 E.T. a few years back with slightly fewer mods than what’s done last post and today as it sits. The night before the event, installing & adjusting the 5-point harnesses. I was joined by two other Z32 TT friends of ours, Billy and Dr. Dean. Billy packs Sport 700s while Dean rocks our EXP-90s. 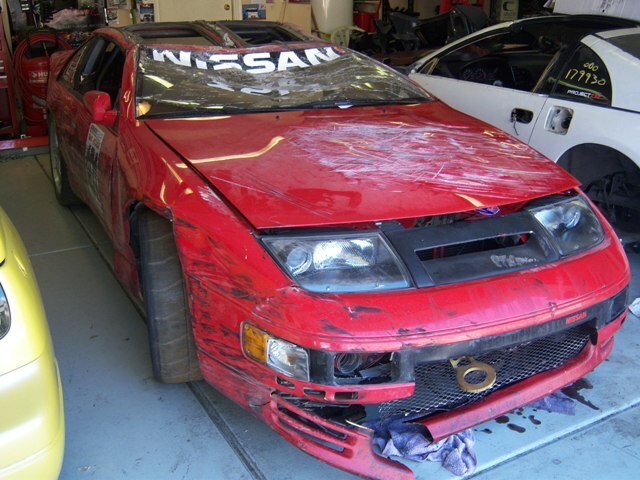 Greg’s Z will be under going upgrades for those curious as to why the SZ Blue Monster didn’t make it. Expect 8s sometime this year. Beautiful day at the track. Billy’s engine bay. We built this baby back in 2006. Billy rocking out on the launch getting ready to eat some pony. 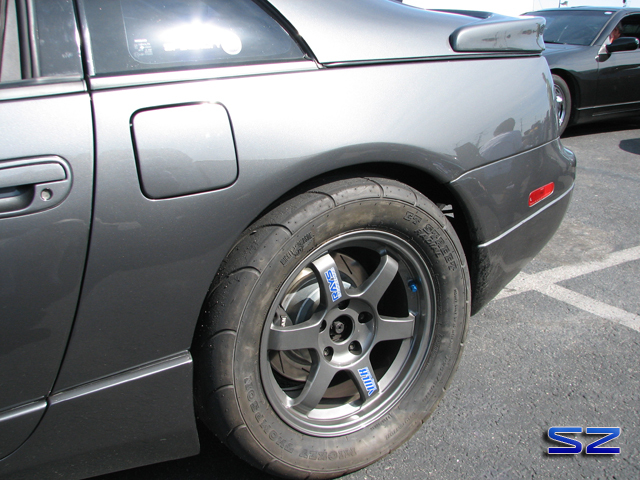 He’s running 18″ wheels with some Mickey drag radials out back. Drive up to the track and racin what he brung! That’s alot of car lengths! His goal of running 10s was accomplished. He ended up running 3x 10 second passes with his best being a 10.8 E.T. Dean came out with guns blazing. However he’s been warned by track officials that if he runs 9.99 E.T. or over 135 MPH he will be black listed from the track. So he dialed down the power and kept it under the limits. His plan is to attempt breaking into the 9s at a different track further away from home. 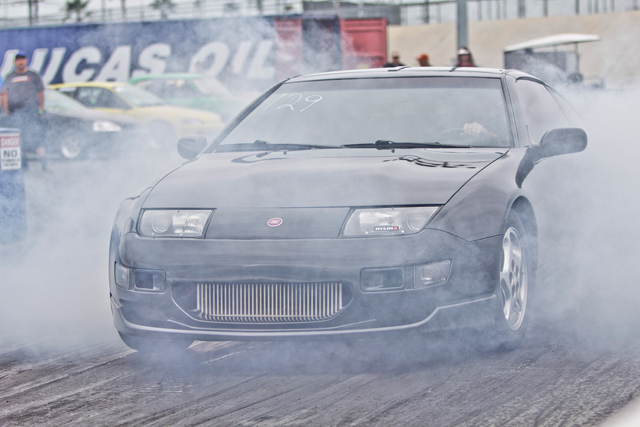 Dean’s Z is a complete street car and sees daily use. Stock chromies with Mickey drag radials. 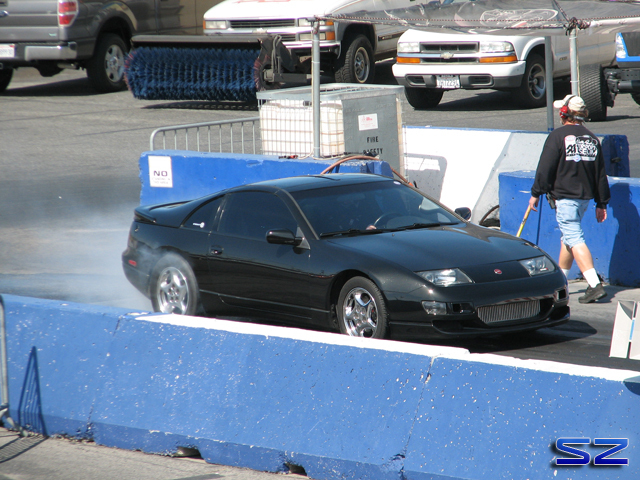 Smokin’ the tires at the burnout box. 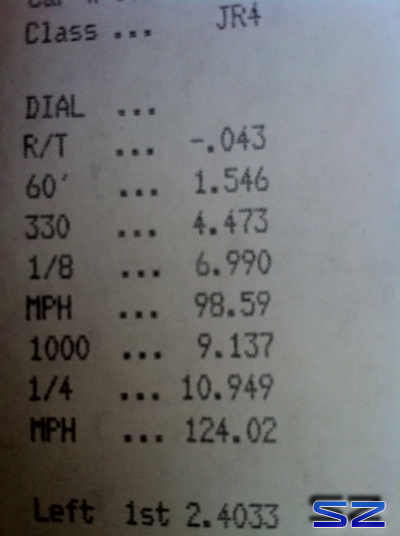 Dean ran an easy 10.2 @ 134 MPH for his best of the day. What’s even more amazing is he pulled 2x 1.4 60 foots!!! Incredible. My #1 fan after Sonia. My 16″ TE37s with Mickey drag radials. Safety first. The rules require anyone running quicker\faster than an 11.5 E.T. 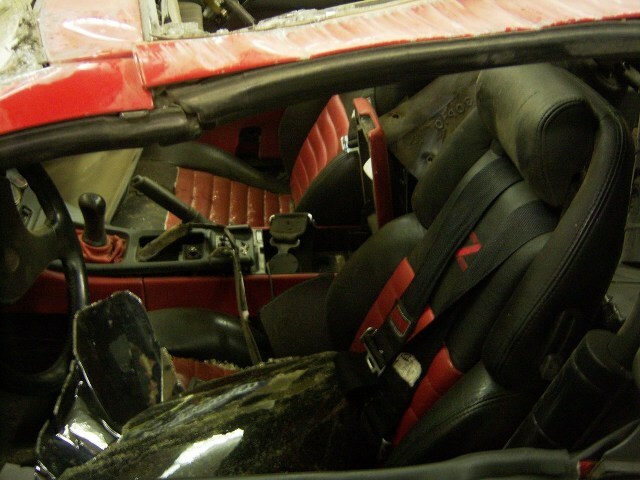 needs to have a 5-point roll bar, 5-point harness’ that are within 2 years of being SFI certified, fire jacket, and helmet of course. There are other rules but these are the most obvious that tech inspectors look for. Scores! 10 second pass in a Sport 500 car and NO nitrous! A good example of a properly put together setup with some decent driving. Look ma! No hands! 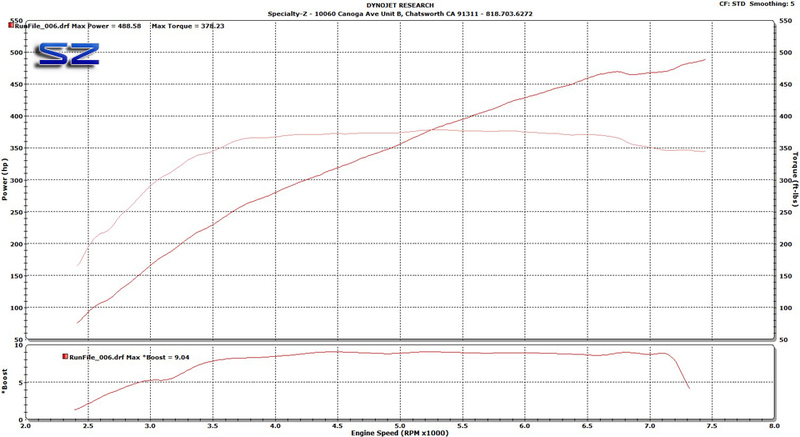 (Automatic) The Z makes 492 whp. Got word that April 22nd will be the next private event. Back in June I picked up a Z34 with intentions that if I bought one it would HAVE to be twin turbo’ed shortly thereafter. When the new gen Z first came out I wasn’t completely sold on its looks. 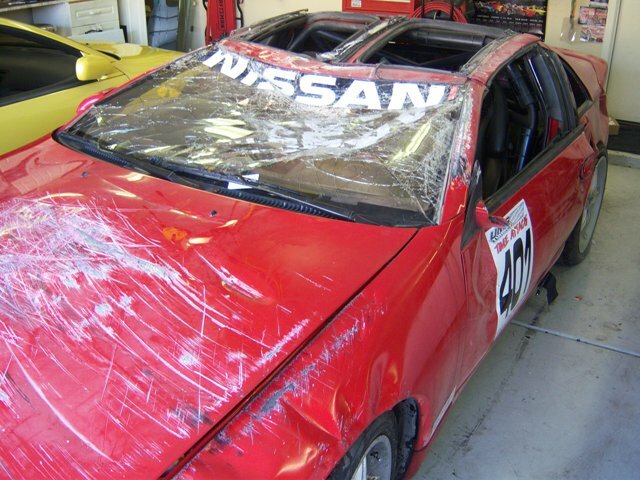 I hoped at the least the engine and interior were further improved upon than the Z33. As time progressed I began to liken the fish hook head lights, although the fangs on the bumper were still undesirable. In any case, I had the burning desire to feel, drive, and interact with the new generation of Z car. 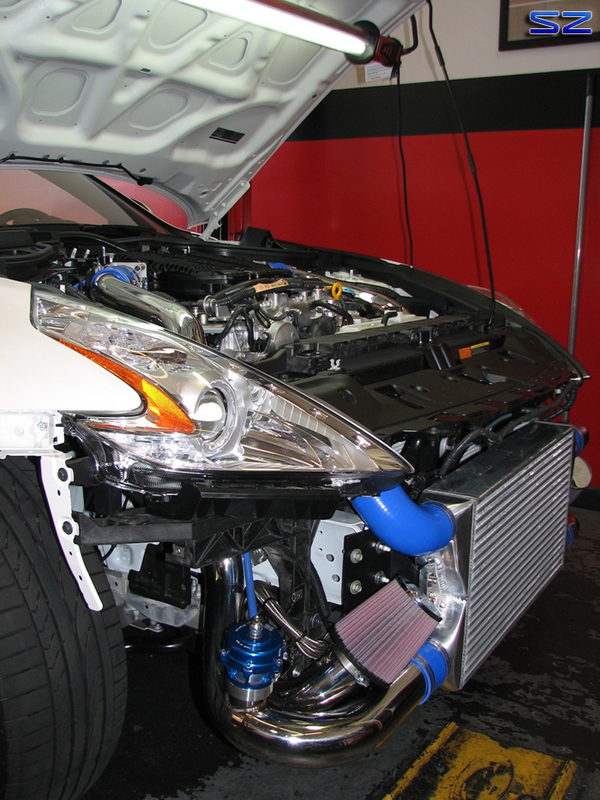 Having played with some at the shop I was pleasantly surprised as to how much better quality was up over the 350Z. Handling is superb while retaining a very comfortable ride that doesn’t bring discomfort to my body. Having owned various high power Zs the added power of the new Z34 was a benefit, but I was spoiled. This is why it just had to be turbo’ed. 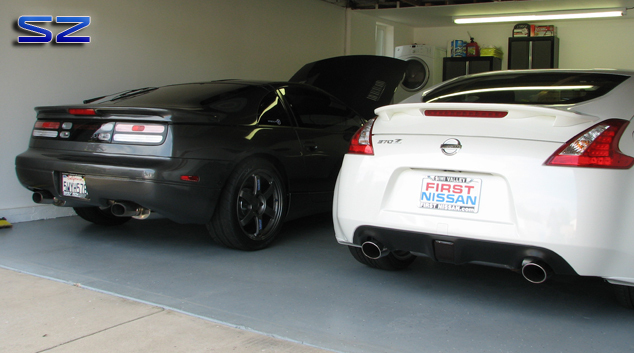 Older brother Z32 gets to share his bedroom and share stories. Looking at the rear of the Z34, the only thing I didn’t like was the rear fog light. Painting the lower portion of the bumper black helped detract attention from it. It’s almost a shame the front bumper has to hide such a beautiful kit produced by GTM. The kit selected to power the Z is a high quality GTM Stage 2. 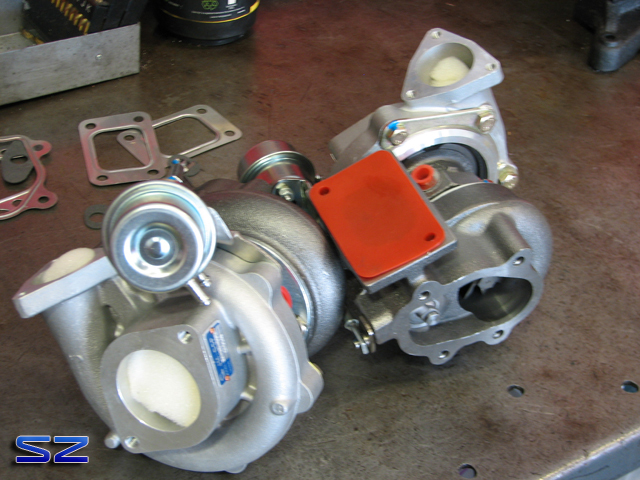 The turbos used are Garrett GT2860RS’ utilizing the .86 turbine housing and Tial external wastegates. 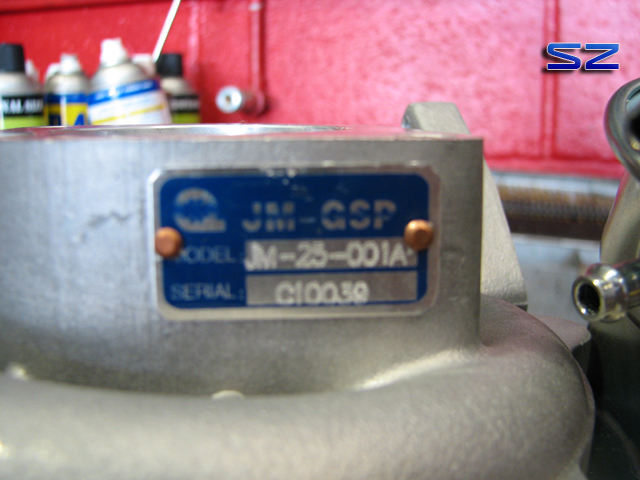 A GTM competition oil cooler was added to combat the already (factory) problematic oil temps. Engine cover painted to match. 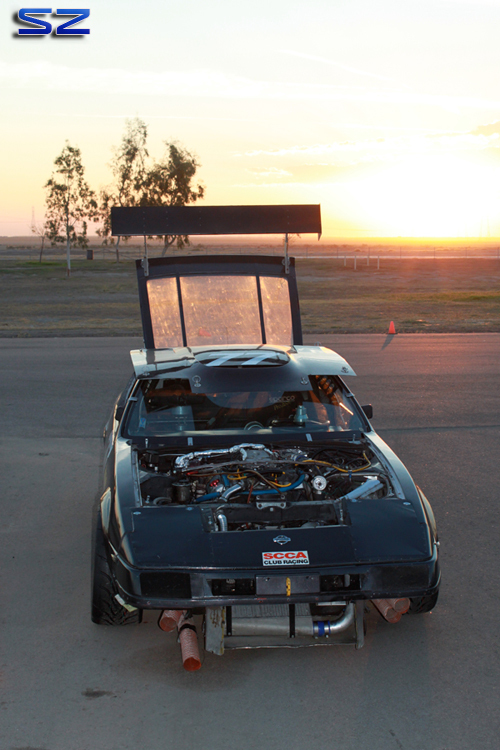 Since the car was to see some drag strip use we selected our flywheel and High 5 Clutch. 6 psi of boost (Boost Controller Off), good for over 400 whp. 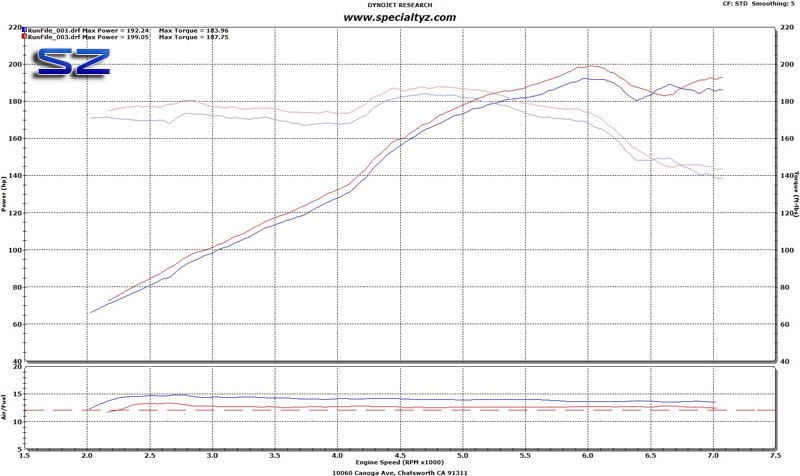 12 psi (100 octane) for 557 whp. This is efficiency! 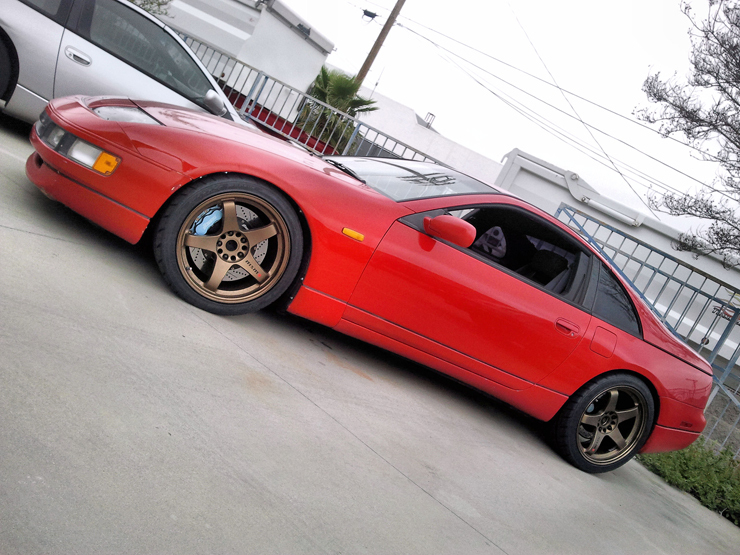 Less boost than a comparable Z32 and making more power for the given boost level. 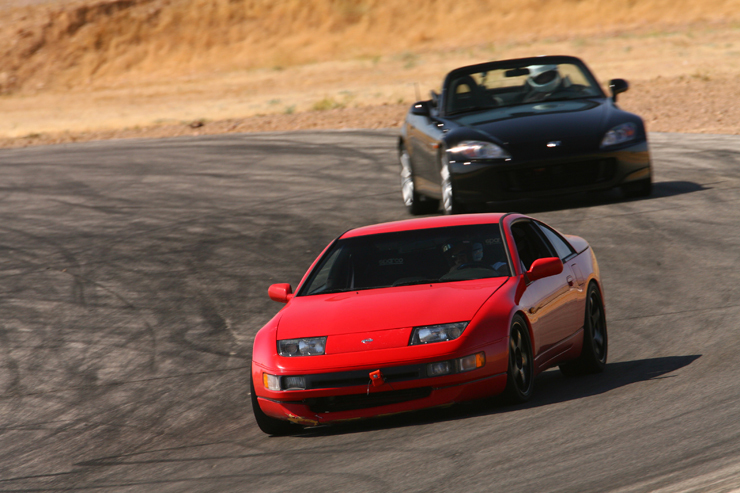 The one thing lacking versus its older brother Z32 is the torque output. 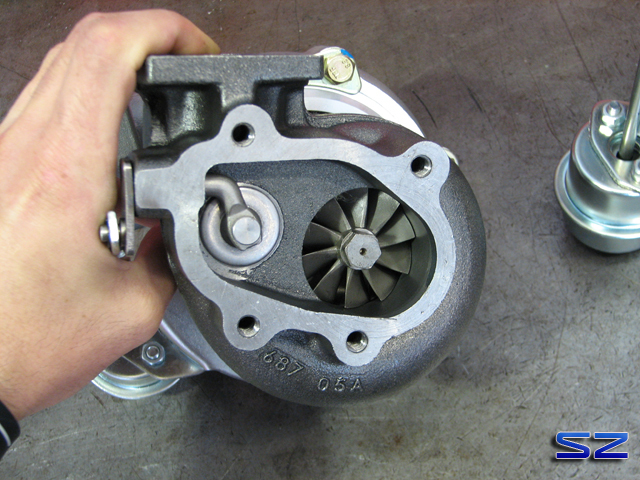 The VG30DETT is good for matching HP & Torque values. 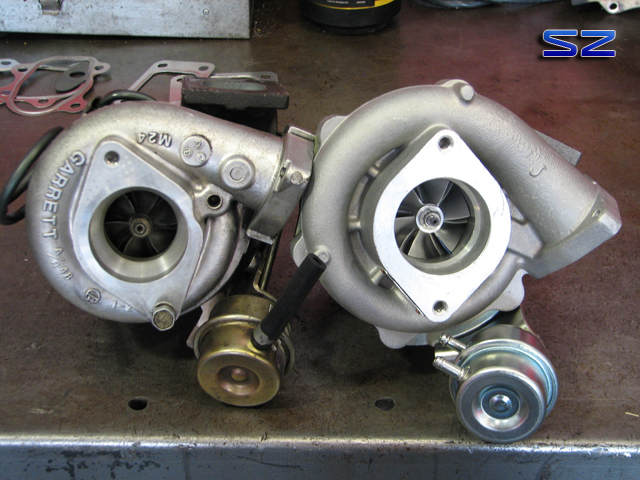 The blue run was the car BONE Stock compared to the red run force fed by 12 psi of boost from the GT2860RS’. Power comes on very smoothly unlike a Z32 which can be violent. Due to in part by the flat torque output. It feels like the car could have come equipped force fed from the factory, its that good. 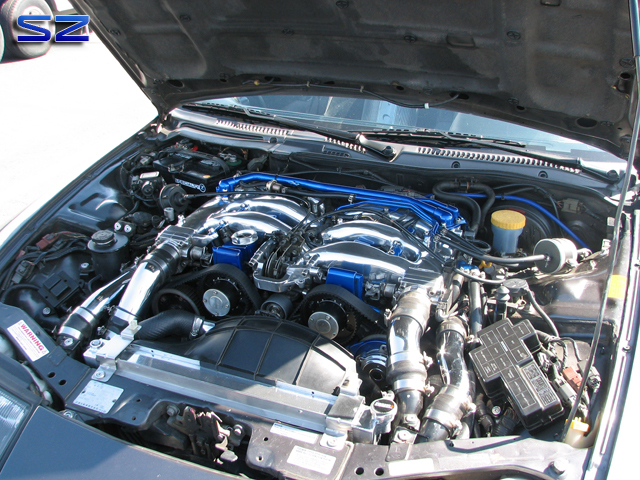 The VQ37VHR engine acts as if nothing were different with this amount of power running through its veins. 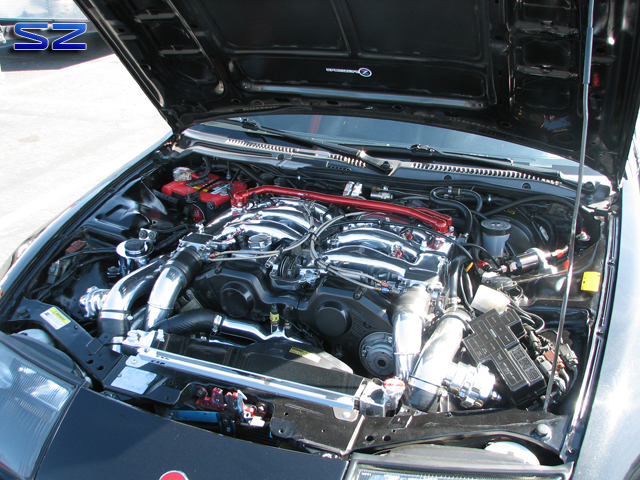 Something the old VQ35DE could not accomplish on a factory engine. 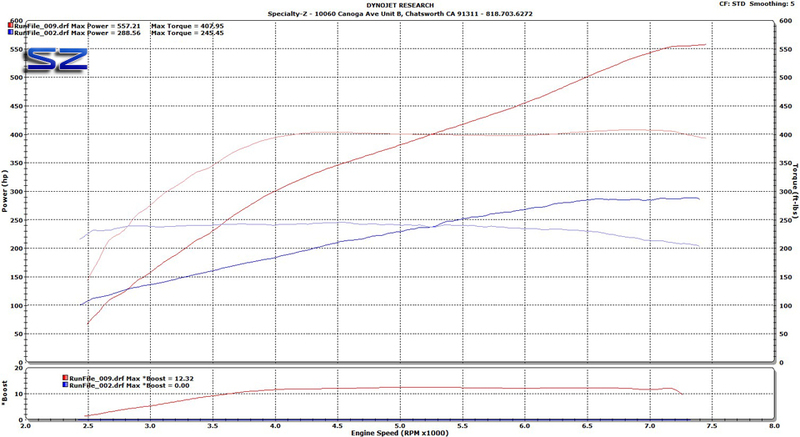 The bone stock VQ35DE could really only safely muster under 400whp. Anymore and you risk certain catastrophe on the VQDE engine. On its first maiden voyage down the 1320 the Z and I (CAR #7293) were able to break into the 11s. Prior to this it had been over 5 years since I last banged the gears down the track. I can say this car is limited mainly by my driving and with some practice it should see low to mid 11 E.T.s. 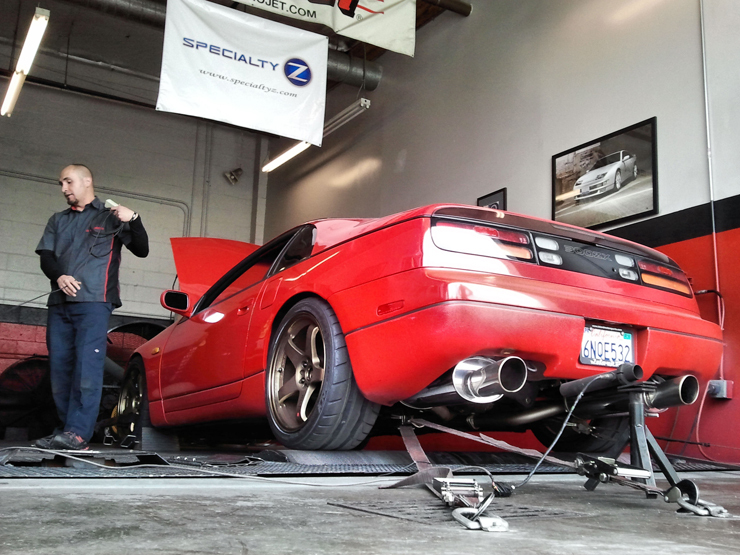 A few weeks back we got a call about Z31 needing some dyno time. 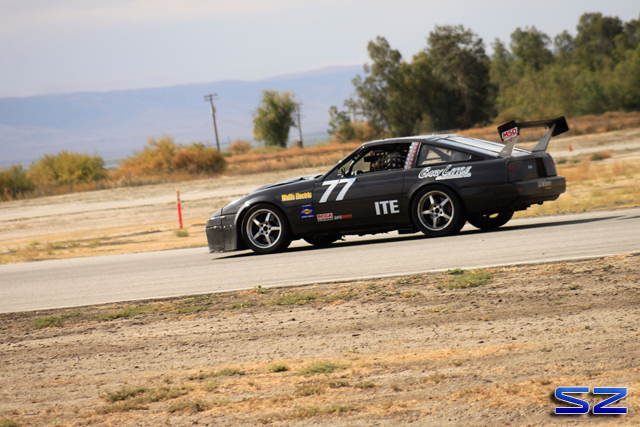 Owner’s Todd and Tyler Deal were battling misfiring and poor running performance out at the track. 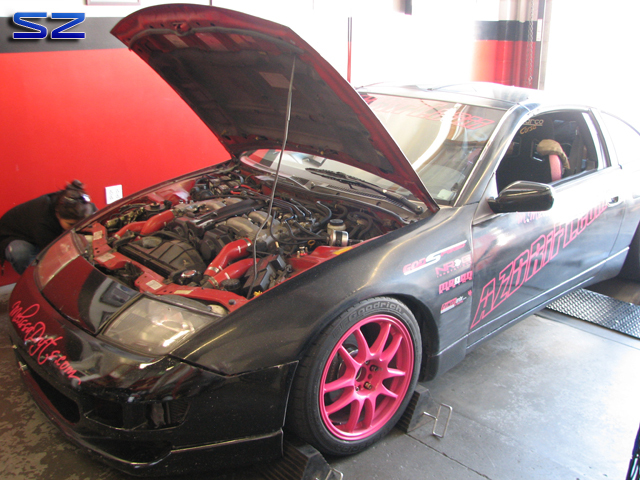 This Z has an impressive list of parts one is a wickedly built SOHC VG30 that makes use of a VG30DETT crankshaft. The car and its parts don’t look impressive but this car does surprise once it finally was fixed. I don’t have all the details on the car but it obviously has a healthy sized T3 framed turbocharger, JWT Cams, 2.5″ I\C Piping,Greddy Recirc Valve, Tial W\G, Greddy Profec B B.C., and AEM Water\Meth Injection. The water injection does an excellent job in keeping engine coolant temps down believe it or not. 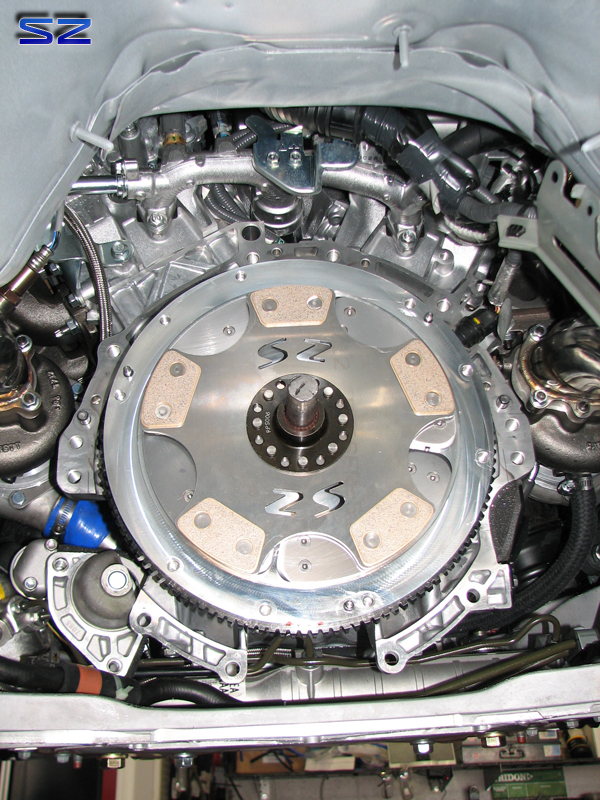 This Z also makes use of a transmission cooler & pump to combat unwanted heat in the gear box. This 1984 Z depends on the use of JWT’s ECU conversion that uses an 88-89′ NA ECU, Ford Cobra MAF, and Bosch 420cc Injectors for engine control. Resting after a hard day’s work. The I\C can easily be seen along with beat up brake ducting. After a few attempts to make a clean pass on our dyno due to tremendous misfiring, we took over tuning and fixing any mechanical\electrical issues. A shout out to Clark Steppler from JWT for fixing the ECU quickly. The blue run was the way it came in. Really bad misfiring, so much a complete run could not be made. After some time of tuning you can see where ended up on the red run. 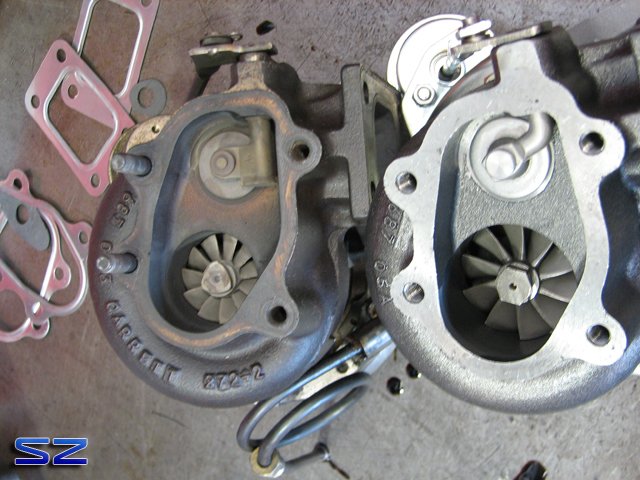 See how torque happy these SOHC engines are. 401 whp & 429 Torque. We’ve known Miss Melissa for a few years now and she’s been a die hard drifter ever since she had the opportunity to try it herself. 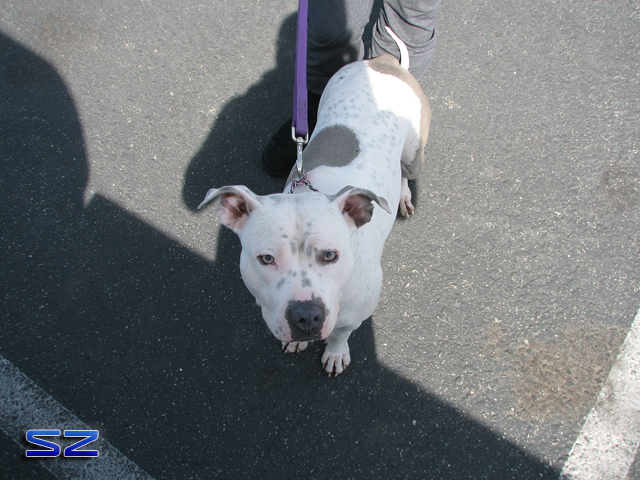 There’s a good chance you’ll see her if you frequent the drift circuits like Irwindale in SoCal. Her poor car has seen alot of abuse but it just keeps going. She sent me a text one day out of the blue if we would install a pair of turbos on her car. I kept an open mind and knew something like this undertaking was opening a can of worms. Its not as simple as one may think, throw some turbos on and your done. Doesn’t really work that way most of the time. 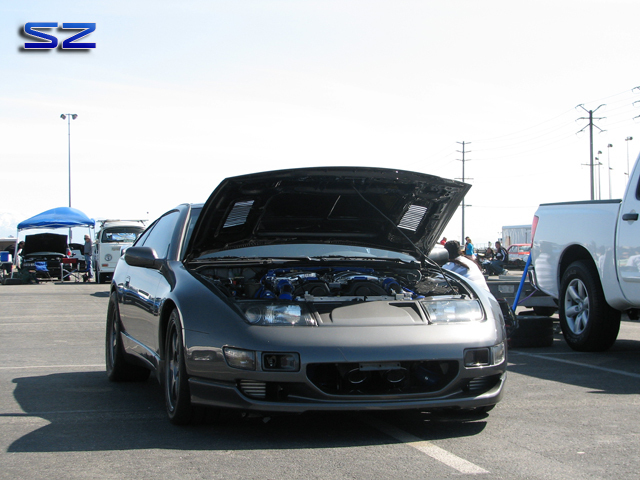 Melissa’s Z32 is pretty stockish in the performance department. 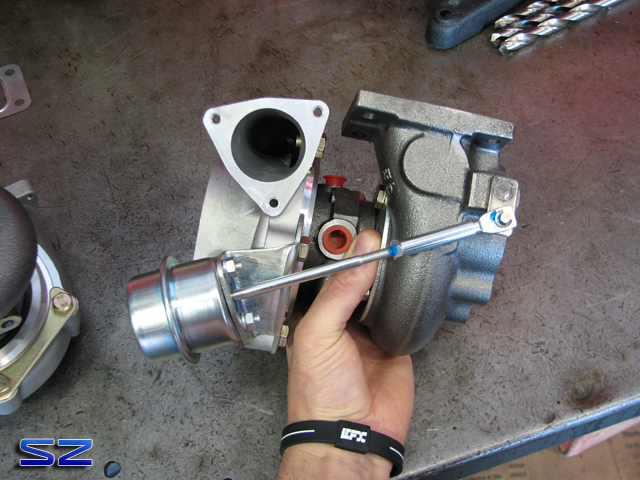 It packs a JWT Single POP, Boost Jets, JWT ECU, Stock Fuel Injectors, Genie Catback, SZ Clutch & Flywheel. That’s it for mods. So when she asked about upgrading turbos we scratched our heads. 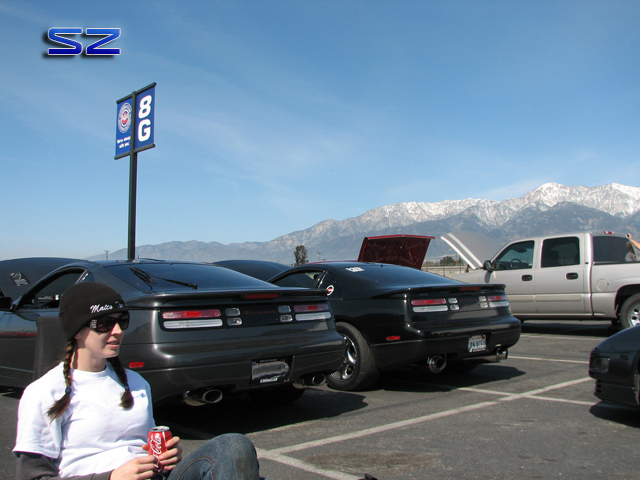 There was plenty more to do before she truly maxed the stock turbos potential. For those who missed it, this is the pride and joy (click me). Godspeed hooked her up with a pair of their new turbos and intercoolers. 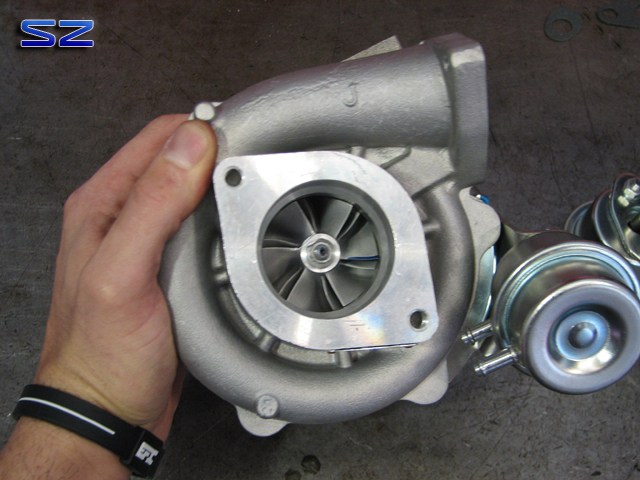 Our opportunity to see what cheap Chinese made turbos look & perform. Chinese parts\copies have taken over our market by storm. Its amazing that the consumer will buy the cheapest option, thinking only with their pocketbooks. Anyways that’s enough of ranting, I can go on and on and on and on and on……..
To simplify things and minimize the can of worms we opted to install the turbos with the engine in the chassis. We found that the wastegates were totally off. One opened at 5 psi the other at 9 psi. We set them for 13-ish psi. Keeping in mind Melissa has no boost controller. Dual port actuator is included. It’s “hot” side. 4-Bolt housing. Much larger housing than stock though. Turbine wheel is a good size. The “cold” side. 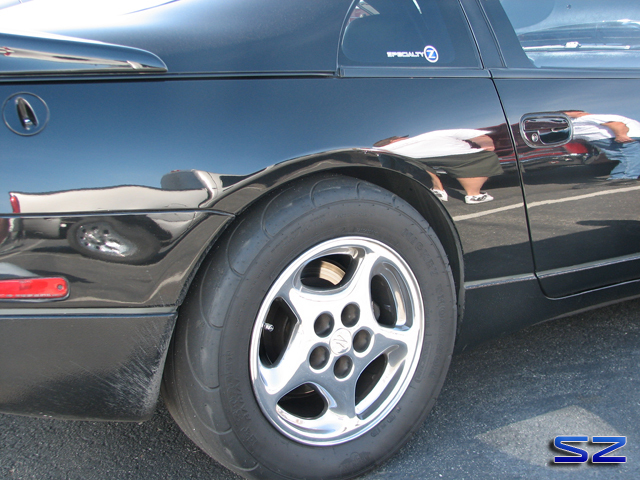 You’ll notice that the inlets and outlets are cast made to fit the Z32 configuration. Turbo Manufacturer (JiaMu). A quick Google search brings up some diesel truckers experiences with them. Let’s hope they last for Melissa’s sake. Stock cold side on the left, Godspeed on the right. Stock hot side on the left, Godspeed on the right. This isn’t a straight apples to apples comparison as you can see the boost levels were different along with supporting mods. 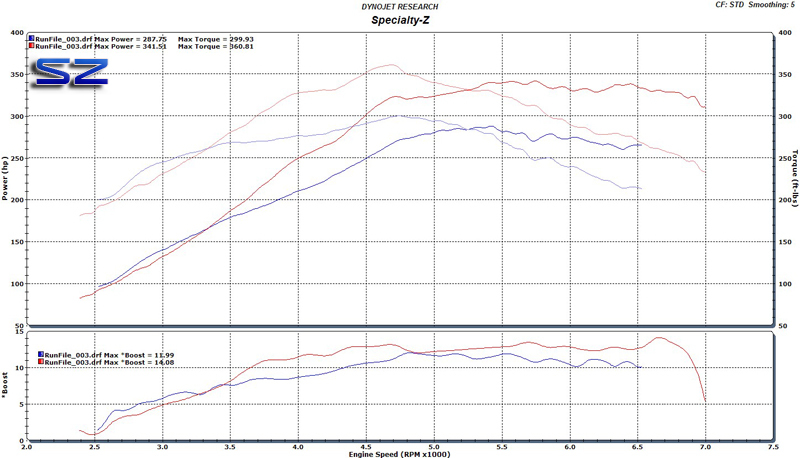 11 psi on the stock turbos, 13-14 psi on the Godspeed. 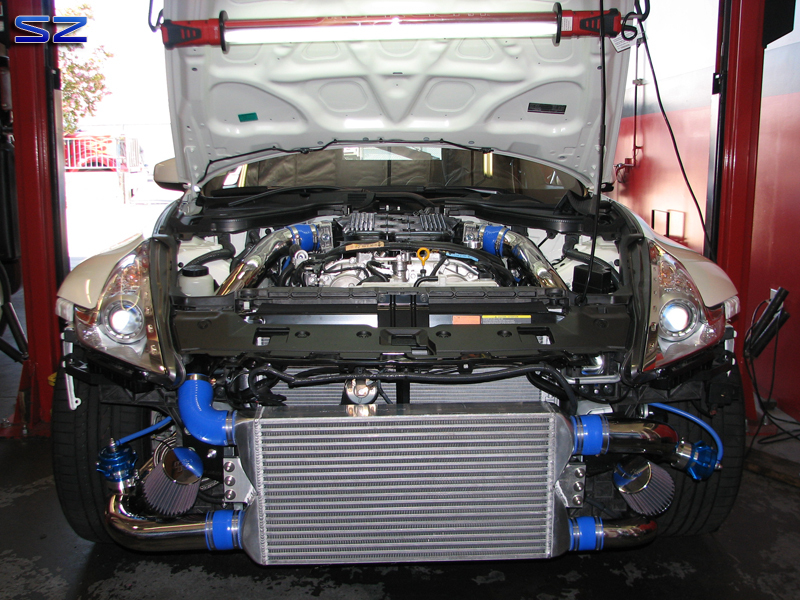 The Godspeed turbos also received a help from their intercoolers along with some down pipes & test pipes. So I wouldn’t go off this graph. 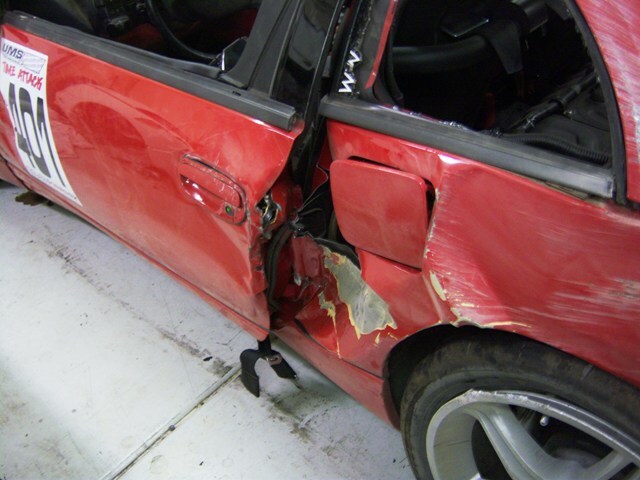 This is just to show the difference on how the car ended up. 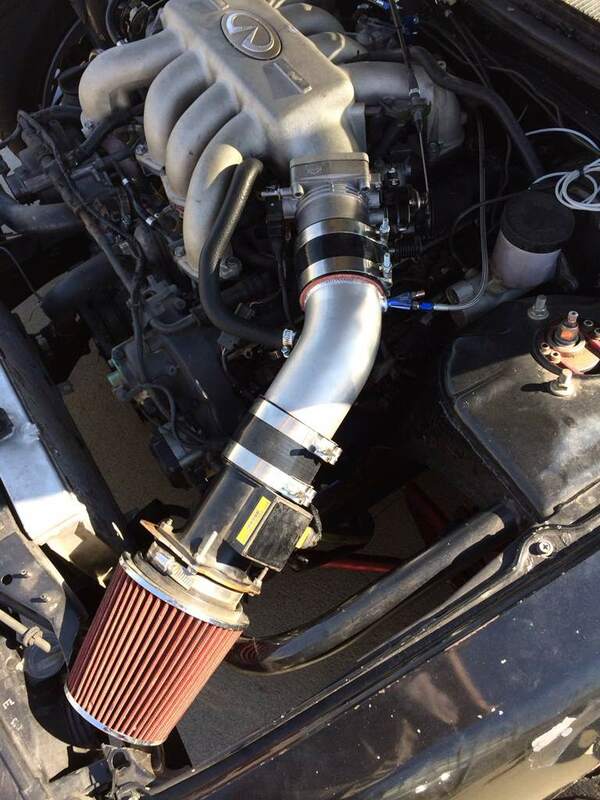 287 whp on stock turbos, stock pre-cats & cat pipes, and stock intercoolers. 341 whp on Godspeed turbos, intercoolers, down pipes, test pipes, and higher boost. Just so we’re clear on differences. No tuning was performed and the factory injectors are still performing fueling duties. This power level is easily attainable on stock turbos as most already know. 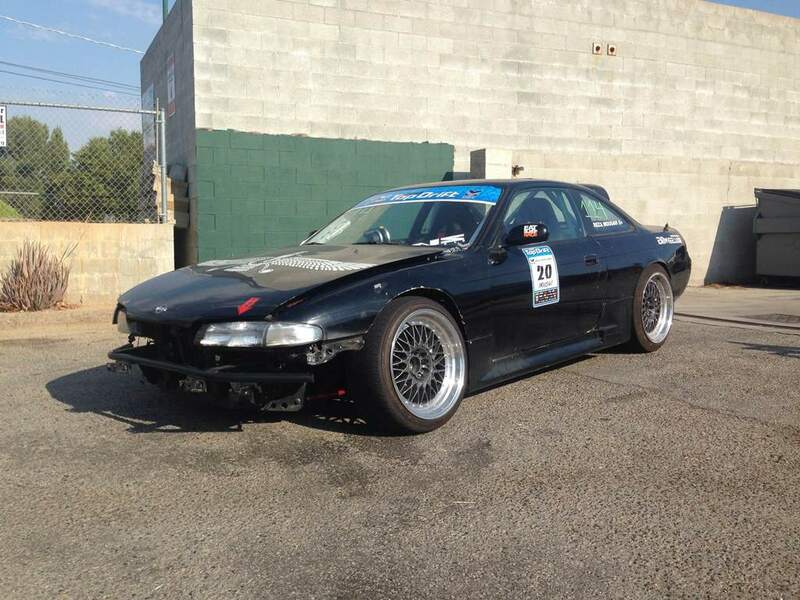 We wish you the best in luck with your drifting quest Melissa, and let us know how the turbos hold up. At least now she’ll be able to smoke the tires more effortlessly through the drift. Rock on.